Uni-Seal® Polyurethane Pig Scraper Cups and Disks by KIDD Pipeline & Specialties Inc.
Scraper Cups That Last Longer And Seal Tighter!" Each KIDD Uni-Seal® Pig Cup features a series of unique, reinforcing webs or gussets, providing stronger structual wall support than possible with standard pig cups. These equally spaced gussets, molded into the pig cup, connect the inside lip to the inside of the mounting flange. The gussets flex inward as the I.D. decreases, and flex outward again as the I.D. increases, thereby giving a perfect seal. Expensive retrieving operations and lost time caused by pig cups turning inside out and plugging lines, are virtually eliminated with our reinforced, dependable gusset design. Regardless of extreme pressure differentials, KIDD's patented, reinforced gussets help prevent the cup lip from blowing out or collapsing. Pressure of the cup lip against the pipe wall is virtually constant throughout of the life of the KIDD pig cup. 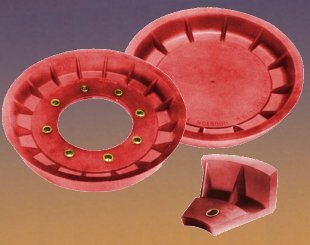 Uni-Seal® Pig Cups For Mandrel pigs have shown amazing performance, outlasting our competition on many instances. One in particular, is our 48" cup with a travel of 3,200 miles without having to change the cups. This is due to the patented gussets keeping the scraper centrally located in the line giving an even wear all around.